I'm a fan of the art and design of the Assassin's Creed game series. It has always drawn me in with the stunningly beautiful environment art, setting and historical context. The idea to allow someone, us as gamers, to go back in time to visit iconic places in history is genius, even if the environments are not totally accurate. 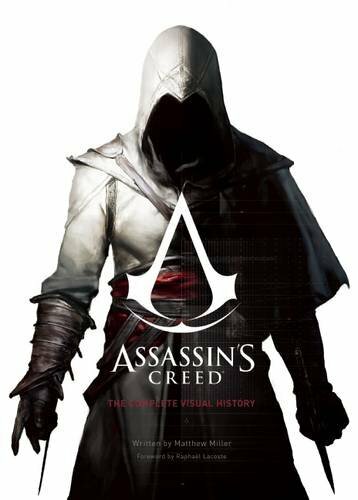 Assassin's Creed: The Complete Visual History is a huge 320-page hardcover that covers the art and design aspect of the game. It includes all the main Assassin's Creed games up to Assassin's Creed Syndicate. I did not buy any of the Assassin's Creed Encyclopedia (currently in its third edition) so I can't tell if there are going to be any overlaps. But I've many of the Assassin's Creed artbooks, for the first, third, IV: Black Flag and Unity. There's definitely duplication of artworks used in this book, in fact quite a lot, which is perhaps not unexpected. There are also many pieces of new art as well, especially since it covers the Assassin's Creed Syndicate which by the way also has its own dedicated artbook. The artworks are awesome, even if you have seen them before. The book is huge and for many pieces of environment art that are printed full page, it feels immersive, as if you're standing there yourself. The background and environment art is what I like most about the game. Other artworks included would be the characters just to accompany the lengthy commentary that runs throughout the book. For fans who want to learn more about the art and design, there's plenty to read. About one third of the book is text. The insightful commentary talks about the historic context and how the characters, environments and stories are created around that. There's one chapter devoted to the First Civilisation and how it's the overarching element all the games. There's also one chapter on the side games, the Chronicle DLC series. It includes content for China, India, Russia. And lastly there's a chapter for the other merchandise and marketing materials, such as the cover art for the games, toys and other collectibles. Strangely, the other artbooks and the Encyclopedias are not mentioned. Novels are briefly mentioned in one line. I'm sure there are many more merchandise that are not included, such as the limited edition game releases and their goodies. I would love to see those. By the way, there appears to be two publishers for this book. Mine's from Insight Editions. The other publisher is Titan Books who has somehow listed the book has having 264 pages which I'm pretty sure is not correct. This is not the first time it has happened. Overall, this is a fantastic artbook and visual companion for the games. Highly recommended to all fans of the game and art.